For me, cooking is almost as much fun as eating, and after trying the local specialty here in Yangshuo, Pijiu Yu, I wanted to learn how to make it. 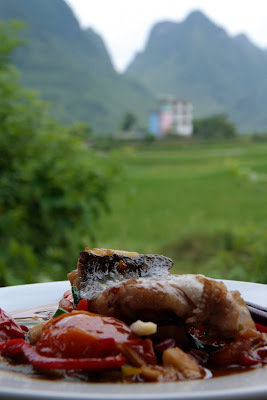 The Yangshuo Cooking School offers a hands-on class making five dishes in their open air countryside classroom just outside of Yangshuo. 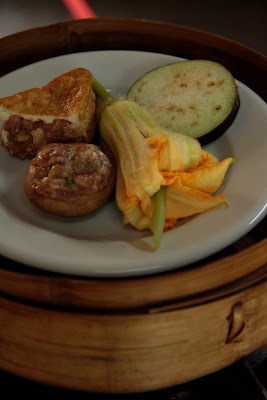 To begin with we take a tour through Yangshuo's wet market with our teacher Jennifer (above). The market is enormous and sells fresh fish and vegetables in one hall, and meat and spices in the other. 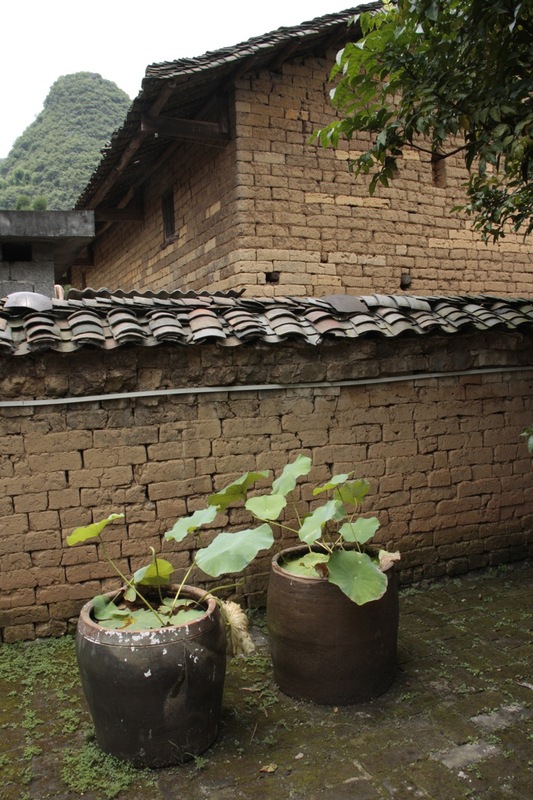 The vegetables are piled in abundant fresh heaps - and there are many things I've never seen in Shanghai - pumpkin flowers, baby taro, tender pink-tipped baby ginger, water vines, and wild greens. The spices are incredible too - sacks of cassia bark, giant star anise, cloves, buddha's fruit and sichuan pepper. We buy what we need for the morning's class, including a huge flapping catfish, and make our way back to the school. The kitchen is in the courtyard of an old village house, and looks out over a thriving vegetable garden with fruit trees, and across rice fields to the mountains. The kitchen sink is a heavy rough-hewn stone tub in the courtyard with a softly dripping tap. We have a refreshing cup of local tea on the open-air terrace before setting to work. Our workstations are already neatly set up with all the ingredients we'll need for the first dish - stuffed pumpkin flowers. We gently stuff the flowers with a pork mixture, the fold over the petals one by one and hold the whole lot together with a piece of edible pumpkin stalk. We set these aside to be steamed and move on to the next three dishes - eggplant Yangshuo style with garlic and chilli-blackbean paste, chicken with nuts and vegetables, and stir-fried wild greens with garlic. Jennifer is a good teacher and all the dishes are simple to prepare under her direction. We eat as we go, taking each dish out on to the terrace to enjoy. 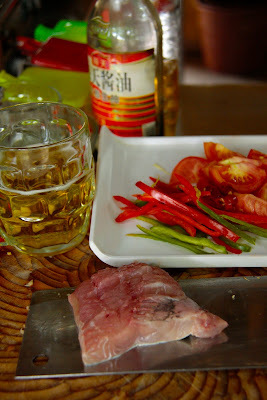 It's then finally time for the dish I've been waiting for...pijiu yu - fish in beer. The ingredients are shown below - a piece of fresh fish with skin on, tomatoes, sliced red and green peppers, sliced pickled chillies, ginger, garlic, spring onions, and of course beer. Jennifer tells us that Guinness is no good for this dish - it really needs a light ale. The fish is first fried skin down until the skin begins to brown, then the ginger and garlic are added, and as their aroma develops, we follow with the tomatoes, peppers, chillies and the beer. When the beer has reduced and all that remains is a rich sauce it's time to put the spring onions in and serve. Dead easy, delicious. 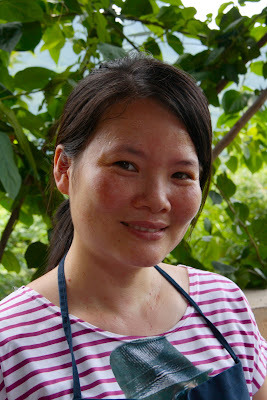 If you ever have the chance to visit Yangshuo, you can find more information about the lovely Yangshuo Cooking School here.